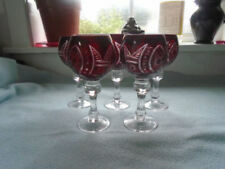 RARE -- Hard to find ROYAL BRIERLEY CRYSTAL MARTINI / COCKTAIL GLASS in the FUCHSIA pattern. Royal Brierley (studio glass) art glass vase. (Large) unique Christmas gift. Royal Brierley (Studio glass) art glass vase. This is a wonderful example of Royal Brierley studio glass. Condition: I cannot find a fault. Acid Etch Mark. Stuart Crystal. Sherry/Port Glasses. Set of Four. 2.25" Bowl Depth. Approx 10.5" tall with the large golf ball stopper. Appears unused. Four crystal wine glasses. By Royal Brierley (although unmarked) in the Elizabeth pattern. 12cms tall x 7cms bowl diameter. In perfect condition, no chips, cracks or scratches. 7x Vintage small wine sherry port glasses. 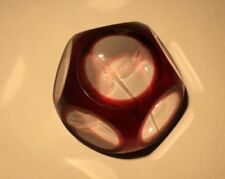 Stunning quality lead cut crystal! Stunning quality lead cut crystal! One glass has a gold fleck on foot very small. Laurus design. 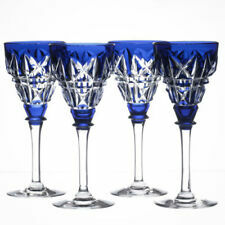 Royal Crystal Rock Fluted wine glasses. Set of four glasses. Discontinued range. I cannot be sure this is indeed Cumbria Crystal. It is very lovely none the less - hence the low BIN. I have used this for water on our dinner table. Stunning Royal Brierley wine glass with cut frosted fuchsias. Six Stuart Crystal 'Stratford' hock glasses. In perfect condition, no chips, cracks or scratches. 17cms tall. Unmarked. 8 HAND BLOWN VINTAGE CHAMPAGNE FLUTES. HAND CUT CRYSTAL CHAMPAGNE GLASSES WITH CLEAR GLASS STEMS AND GREEN GLASS BOWLS, WHEEL CUT ENGRAVED PATTERN, ALL IN TOP CONDITION WITH NO ISSUES HAVING NEVER BEEN USED. EACH PIECE STANDS 23CM HIGH WITH A LIP DIAMETER OF 5.5CM, PLEASE NOTE THAT THESE PIECES ARE HAND BLOWN SO HAVE VERY SLIGHT VARIATIONS IN SIZE. PLEASE VIEW PICTURES FOR FULL VISUAL DESCRIPTION. OFFERS OVER STARTING PRICE WILL BE CONSIDERED UP UNTIL POINT OF FIRST BID. PLEASE USE MESSAGING SERVICE FOR ANY INQUIRIES. Stuart Crystal Hurricane Lamp Base, Signed Measures 8.2cm tall by 5.6cm across the top and 11.1cm across the base, fantastic preowned Condition, Discontinued range Inner top measurement is 5cm, I do have a cascade lamp but it is to small to comfortably fit inside this base!! Thanks for looking Any questions please ask Will be very well packed Dispatched with Royal Mail 2nd Class. Waterford Crystal Vase NOCTURNE Immaculate. Fill it Up for Easter ! Beautiful Waterford Crystal Vase. Treats such as Mini Easter Eggs, Handmade Chocolates, Boiled Sweets in pretty wrappers will all look stunning. Dont feel restricted to filling only with flowers either ~. Downsizing forces sale of much of my beautiful Tyrone, Waterford and Edinburgh Crystal. 'Tyrone' stamp etched on base of each. Each glass holds half a pint! Downsizing forces sale of much of my beautiful Tyrone, Waterford and Edinburgh Crystal. 'Waterford' stamp etched on base of a couple. 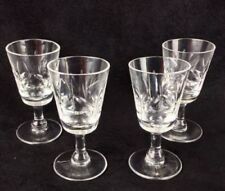 5 X BOHEMIA CRYSTAL SHERRY PORT GLASSES, good condition but used . UK bidder only. Small Caithness Glass Vase. . Condition is Used. Dispatched with Royal Mail 2nd Class. Waterford Crystal. Glass is signed. We fully understand that things can go wrong for a variety of reasons. Three glass sherries with cut bowls and stems. 11.5cms tall x 5.5cms bowl diameter. In perfect condition, no chips, cracks or scratches.